Do you have a serious reader in your life? Maybe you know somebody that doesn't read, but you'd like to not-so-subtly encourage them to start? In the old days, you would take your carriage to the nearby village and pick out a book from a huge shelf, usually with advice from the store owner. Sounds like a lot of work, right? Forget that noise, now you can get the same thing done from right inside the Play Books app. 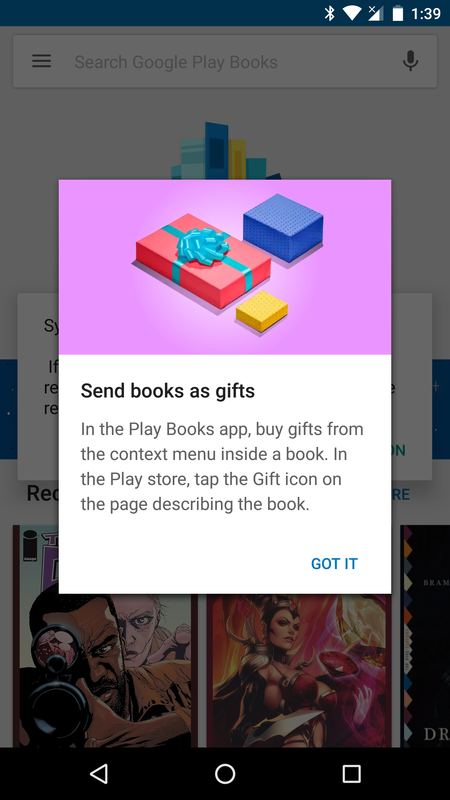 Open up the Play Books app and you are likely to see a new promo screen advertising the ability to gift books. 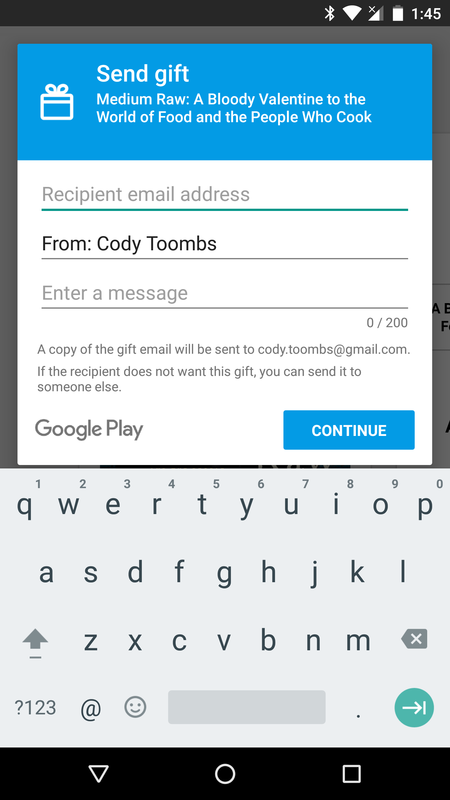 All that's required is picking out a book, opening the gifting dialog, and filling in an email address (with optional message). Oh, and you've got to pay for the book, of course. As easy as this sounds, the process is less intuitive than you might think. 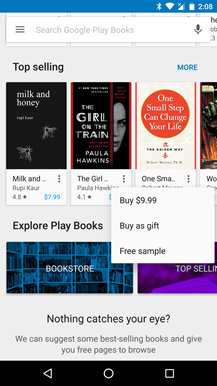 The only places we've seen where the option to buy a book as a gift are either from select screens in the Play Books app or from within the reading screen. 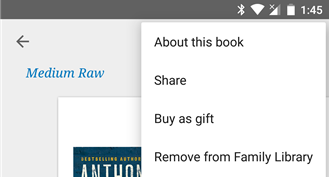 This means the option is only readily available if a book is in the front page recommendations or if it's in your library. Fortunately, free samples also count, so you can buy a book for somebody without necessarily owning it yourself. 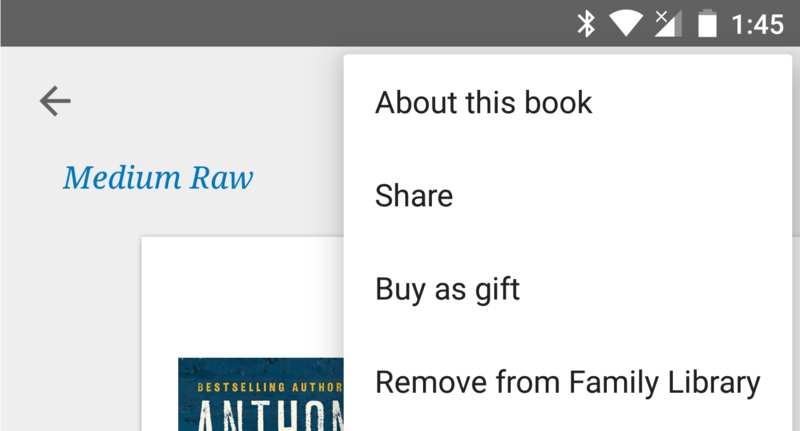 According to the promo, it's also possible to send a book from within the Play Store using a little gift icon in the description page. I'm not sure if this is slowly rolling out, but it's not available for myself or any of the other Android Police team at this time. Preparations to launch book gifting started about a month ago, but reports suggest the promo only started showing up in the last couple of days. Play Store gifting has come up quite a few times over the years, but aside from store credit and subscriptions to YouTube Red, this is the first time gifting a single item has been supported outside of special situations (e.g. gifting to educational accounts). Apps, movies, and television shows will probably join books in the coming months, but there's no recent activity to confirm that. Now all we need is to be able to share our wishlist so people actually know what to buy for us.